Little Bit Funky: Adding things boys love to things boys love - a sponsored post! Adding things boys love to things boys love - a sponsored post! Recently my boys were sent some of VTech's new Switch & Go Dinos™ to test drive. To say the boys loved them would be an understatement! 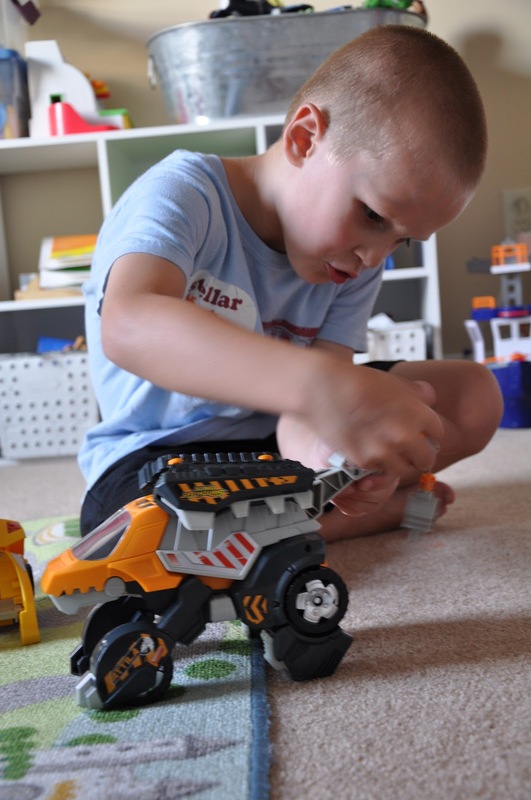 The new dinos combine two of my boys' favorite things...make that three things: cars, dinos and toys that transform! From the moment they got the toys out of the box a few days ago, they have been constant companions. They have made several trips to the store with us and have been carried (or driven) from room to room. The boys love how the dinos "talk" to them and how the sounds that the dinos make add to the play they are already doing! For example, when one of them is transformed into a dino, when you roll it across the floor it makes stomping sounds like a dino would in the woods, another makes car noises as it drives. The LCD screen that shows different drivers and other fun details is also pretty awesome! VTech is challenging kids to "transform their imaginations", and these toys do a good job of catapulting my boys in that direction. You may think that a "tech" toy would dull the imagination, but these have done just the opposite. The boys love the interactive noises and sounds (that have a volume control for us parents!!). They love that these are toys that they can play with and "do" all by themselves. There isn't much that is more frustrating to them then having to get help to use a toy right...that's not a problem there. They have gone between dino to vehicle many times all on their own. These are very kid-friendly, intuitive and easy to enjoy toys! Show – What does your child's Switch & Go Dino look like? o 3. Customize: They can update their own VTech Switch & Go Dino with accessories and fun props to give them a new image! VTech wants to hear about the cool things your child's Dino does. What makes it large and in charge? Encourage your child to name it and share its roaring sound effects. • One grand-prize winner will get a kids lifetime supply of educational toys from VTech. And your video will air on a VTech commercial on Nickelodeon, which you can watch at your very own viewing party with your friends and family. And VTech will also transform your living room into the ultimate Dino den! Give it a go and click here to enter!! 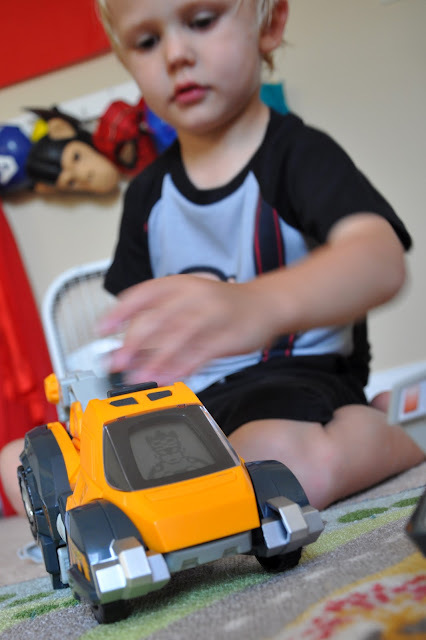 For other bloggers' reviews and to see other customized Switch & Go dinos, visit the VTech brand page on BlogHer.